GETTING the best from a canal swim through the colder months can be demanding task. The water is often very clear and cold at this time of year and the fish that will feed will often do so only carefully. It’s all too easy to feed too much, and to blow your swim even before you have begun. It’s best to talk to open match anglers about winter canal fishing, especially those who take part in the many winter leagues on the region’s canals. These guys fish when the going is tough and when they have quality anglers all around them, and they need to have a solid understanding on what to do to maximise catches in a five-hour session. Enter Maver backed canal maestro Paul Boothby, who we joined on the towpath of the Wyrley and Essington Canal near Little Wyrley. Conditions on the day of our session were not the best. It was overcast with an annoying drizzle, but importantly it was a fairly mild day and it was this factor that prompted Paul to opt for an approach geared towards quality fish and centred on chopped worm and casters. “I would be hoping for some quality roach today, plus some bonus large perch and just the off chance of a tench perhaps,” said our ace as he tackled up on a canal that has gained a strong following in the last three years, thanks to its ability to produce fair sport year round. Paul explained that with some canal stretches noted for being full of small fish and some having a good head of quality fish, you need to have done your research about your chosen swim before buying your bait. “There are areas where I would be concentrating on roach on squatt and pinkie and where I’d be prepared to go through two pints of squatt in a session,” he said. “On those venues I would only have a bit of chopped worm and caster as a back up. “But this length of cut at Little Wyrley has a good record of producing better quality fish for those that go all-out for them, so I have brought plenty of dendras to chop up and a pint of caster to bulk out the worm and keep the cost down. 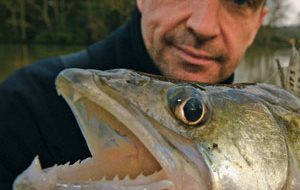 Apart from top quality bait, good organisation is essential to a successful day’s fishing and that includes things like having spare rigs set up, plus arranging your tackle so that you have everything easily to hand. On a canal, that tackle also needs to be out of the way of passers by, particularly cyclists. “Bitter experience has taught me to place all my spare pole sections on a rack system off the ground and out of reach of passers by,” Paul recalled. So what gear was Paul intending to use then to gain the best results from the day? “My pole is a Maver J51, the flagship of Maver’s 2003 range. It’s reinforced with space-age super lithium and bonded with micro-crystal resins, and the rapidity of action is second to none, with the balance and rigidity unequalled in my view,” he said. Having outlined all those qualities of his unquestionably good pole, the nitty-gritty of catching nevertheless really remains down to the angler’s watercraft and understanding of the task in hand. “A superior pole certainly helps a good angler catch more,” said Paul. “But in the end it’s not fancy tackle that usually wins the day. What you need is the ability to put a good rig together, to present a quality hook bait to the fish how they want it on the day, and the knowledge and skill to feed correctly. The swim in front of Paul certainly looked like it held potential for better quality fish. There was an overhanging tree to his right on the far side, the branches of which stretched well out over the water. Plumbing up revealed that there was also a far shelf area adjacent to some decaying sedges over and to the left. “These are the kinds of features that better fish prefer to live near on canals, especially when the water is clear and they are easily spooked,” Paul said. He went on to reveal that he was going to set up two simple rigs, one which was comparatively strong, the other with a lighter approach. The float he went for on the lighter set-up was a peacock quill ‘dibber’ float – a short length of 4mm thick, sealed peacock quill with a painted orange tip and a wire stem. The dibber had an eye on the side and Paul had placed two small float rubbers on the wire stem to connect the float to the line. “I’m using a dibber pattern as I can shot it right down flush to the surface,” he explained. “The tip of a dibber is very wide and this is perfect for fishing right across the canal where it’s hard to see an ordinary nylon or cane bristle. “The float is very sensitive when dotted right down. I shot it with a strung-out pattern of three No11 shot – the float is practically self cocking anyway due to the wire stem. “This rig is for targeting roach,” he continued. “The main line is Maver Genesis Smart 0.12mm and the eight-inch hook length is 0.10mm, although I may go lighter to 0.08mm if bites are hard to attract at any point. 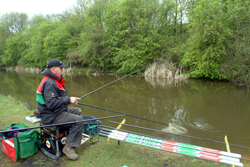 Paul’s plan for the lighter rig was to fish only caster and to try and tempt roach and small perch. Paul’s heavier rig comprised a Maver float pattern with an oval-shaped body and a 2mm thick nylon antenna painted blaze red, Paul’s colour of preference on canals. “The line I use in conjunction with this rig is Maver Genesis Smart in 0.16mm diameter and I fish this direct,” he said. The hook Paul was using on this rig was the again a Katana Series 2 in size 16 or 18. “The way I shot the float is with three No8 shot spread closely at mid depth then two no10s below, with the final one sitting about six inches from the hook to start with,” he said. Elastic choice for the heavy rig was Maver Dual Core in size 12-20. This twin core elastic is hollow and has an incredible stretch factor that many top anglers feel means it will outperform all normal solid elastic in terms stretch, strength and wear. Several manufacturers now offer a dual core elastic and the Maver one is also available in sizes 6-10, which can also be perfect for winter carp fishing when there are also plenty of silver fish and small carp about. In order to ensure the smooth passage of the elastics through the tip section of his pole, Paul always adds a few drops of lubricant, in his case Maver’s Siltastic Pole Lube. Once he was rigged up, Paul turned his attention to feeding the swim. “I’m going to chop up worms and add casters to that mix after chopping,” he said. “I’ll feed with a pole cup at the start, although I will use a catapult for loose feeding casters. “My initial baiting is geared towards provoking a response from larger fish and consists of a medium sized pot full of chopped worms and casters. “I’ll introduce one pot to the area near the overhanging tree branches where the water is slightly deeper at the bottom of the far shelf. After depositing the initial amount of chopped medium sized dendras and casters, Paul started on the heavy rig for the first half an hour in the deeper water swim. “Quite simply, the number of occasions when I have had big fish come on the first bite in matches is incredible!” he said. While he’s fishing the ‘big rig’, Paul loosefeeds around half a dozen casters every five minutes over the top of the two feed areas in order to provoke a bit of fish movement. “Small fish activity should encourage big fish activity sooner or later,” he said. A 1lb 8oz tench followed by a 1lb perch in the first ten minutes justified his decision to commence on the heavier set up. “Anglers can get caught out on venues like this by fishing too light. I know there are enough decent fish in this stretch of the canal to justify the heavier rig from the ‘all in’,” he said. Both fish came to a half a worm, and Paul described how he likes to mount the worms on the hook. “I break a worm in half and then thread the hook down into the thicker, broken end and out through the side. This way the worm will act naturally on the hook,” he said. “When I get a bite, I like to pause a couple of seconds before I make a strike when I’m using worm on the hook so as to allow the fish to completely engulf the large offering. By breaking the worm, juices will be released into the water, making for an even greater attraction. 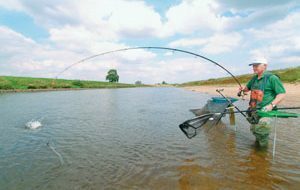 “I like to bury the hook in a single caster and I will also experiment with double caster on the heavier rig. I would also point out the need to vary the colour of the casters. Some anglers love deep red, crispy casters, but using other shades have brought fish to me when deep reds have failed. I would always ensure I have a range of colours with me,” he revealed. Paul changed to the lighter rig after his initial success with the bigger fish. He re-fed the swim near the tree from where he had caught both bonus fish with a smaller amount of chopped worms and casters. “I’ll top up with chopped worms only maybe once per hour on average in the colder months,” he indicated. “Chopped worm is pretty instant and if there are fish around they will move in quickly as a rule. If there are a lot of fish you will get bites to start with and then they will start to die off as the fish hoover up all the bait. That’s a signal to feed again. The switch to the lighter rig brought some roach with a couple of small perch and one roach of around 8oz. Most of those fish came on the drop, but the activity was far from fast and furious. “You just have to be persistent when it’s cold,” Paul added. “Bites can come all of a sudden after a period of inactivity and you have to be ready to hit them. A change back to the heavier rig on a regular basis brought a few indications, but no more big fish until late on when Paul managed to latch into a surprise small jack pike. “Well if they count in matches, then I am happy to catch them!” he grinned as he carefully wrestled with the toothy predator in order to unhook it after it had swallowed the worm hook bait. A modest mixed bag was Paul’s hard earned reward, but he was quite pleased with that result. “At the end of the day in match fishing you pays your money and you makes your choice as they say,” he concluded. “Sometimes I feel that a big fish approach, a rather all-out attack, can pay off especially in individual opens. Clearly you have to know the potential of the water you are fishing though. 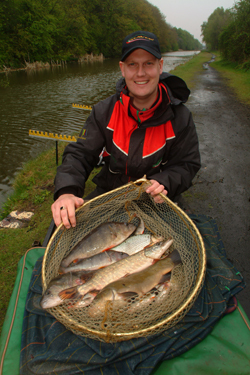 “I would urge match anglers and pleasure anglers alike who may be reading this not to miss out on some very good cold weather sport which can be found on the Midlands canal network. And it’s made all the better by the fact that there is very little boat traffic to churn up your swim at this time of year. You should always pause momentarily before you strike when fishing chopped worm, perhaps counting to two or three before hitting home the hook. “This is even more important in winter when it takes the fish a bit longer to swallow the bait,” says Paul. Paul used medium sized dendras for his chopped worm mix but it’s a good tip to include a few lobworms in your initial choppie mix, also chopped finely. Out to the east of the region on the drains, many top match anglers rate a lobworm head as a better bait for picking off the biggest fish in the swim than a piece of broken dendra. Paul says it’s important to have casters in different stages of their development in your bait box. “There have been many days when I have been able to catch on a light coloured caster and not on the dark ones, and vice versa” he says. Contact: Paddy Wootton, tel: 01543 878584. Day tickets: Only £1.50 on the bank. Yearbook: £8, concessions £5. In other words, it’s as cheap as chips. How to get there: Leave the M6 at J12 and travel east on A5 towards Cannock. Take the B4154 to Wyrley Common, turn right down Wyrley Lane and park over the canal bridge. Access is via the bridge.